Rivertrace, producers of water quality monitoring products, will be showcasing their Smartsafe ORB and Smart ODME, during Marintec. The Oil Record Book Bilge Overboard Security system (Smartsafe ORB), records the oily water discharge process of any oil water separator (IMO-MEPC 60.33 or 107.49) thus avoiding the common mistakes of manual entries and log variations in the oil record book. 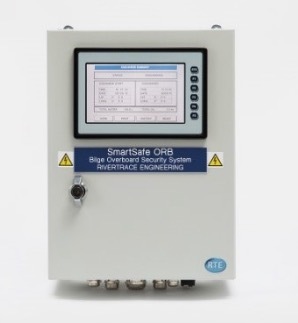 The Oil Discharge Monitoring Equipment (Smart ODME) has been designed to provide means of monitoring, recording and controlling the ballast discharge in accordance with the requirements of MEPC 108(49). Discharge limits are set at 30 litres per nautical mile, and the total discharge is expressed as a proportion of the previous cargo for dirty ballast. The Smart ODME includes all components required to meet MEPC 108(49) and is designed for ease of installation and maintenance. Rivertrace are at the forefront of designing systems that not only meet but go beyond the requirements of tightening environmental legislation. An ISO9001 quality-assured company and market leader with over 30 years’ experience of oil-in-water monitoring. Headquartered at a 10,000-sq. ft. facility which incorporates a production factory in Redhill, 20 miles south of central London, Rivertrace has actively developed a global presence covering 32 countries, serviced by 28 technically trained distributors & agents. Stock is held at these key locations to ensure local service is available to support customer needs.